Posted Jul 28, 2018 by Eds. Can you talk about your involvement in the labor movement? I have been active in the labor movement for 33 years. I joined NUMSA as a member on August 7, 1987. I was employed in a motor component company that manufactured exhaust systems. I became a NUMSA shop steward and then a local office bearer. All of this was in the Western Cape in South Africa. Later, I moved on to the regional work and in 2008, I was elected as NUMSA Deputy General Secretary, then again in 2012, and again in 2016. I think it’s time for me to hang up my boots and allow younger people to come in…so that’s my involvement as a trade unionist in NUMSA. My activism started in the church as a youth leader. Of course, I was very rebellious even in the church, to the point that the elders decided to close down the youth association because we were just too radical. At the time, I subscribed, as many of us did, to liberation theology that had mainly emerged in Latin America and of course, it wasn’t long before I got involved politically as an activist. I served in the then United Democratic Front (UDF) which was established in 1983. I became a member of the African National Congress (ANC) underground movement and was in the armed struggle. I also then got involved in the civic movement. So that is me in a nutshell. Can you tell us about the history of NUMSA and what it is currently working towards? NUMSA was established in May 1987, by the amalgamation of 7 different unions in the metal, motor, auto and engineering industries. From the outset, NUMSA has been a socialist-oriented and Marxist-Leninist inspired trade union. In our constitution, in the preamble in 1987, we declared our intention to fight oppression and exploitation, to build international solidarity and worker-to-worker contact. This was when under apartheid, there was a Communist Suppression Act which made it illegal to subscribe to communism or socialism. Yet NUMSA, without making a direct reference to communism or socialism, found a way of formulating our objectives in the constitution. To this day, we have not deviated from our perspective of Marxism, Leninism and the building of a socialist South Africa. Of course, for all of this, we became very unpopular within the ANC-led alliance that included the of South African Communist Party (SACP) because we were clear that if the working class was to be emancipated or economically liberated, then the interests of the working class, including that of the peasants and the rural poor, must be at the center of everything else that we do. It became clear to us that the ANC, SACP and Congress of South African Trade Unions (COSATU) no longer championed the interests, struggles and agenda of the working class against capitalist exploitation, the ruling class, and against the state. And this is why eventually, we got to the point of saying we need new revolutionary tools to advance the struggle of the working class. Hence, in December 2013, we came up with the idea of building a new federation. 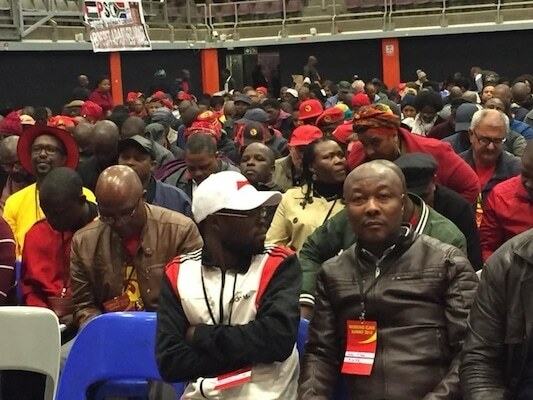 On April 21 this year, the South African Federation of Trade Unions (SAFTU) celebrated its first anniversary and we also conducted a massive general national strike on April 25. All this tells us that establishing a Socialist Revolutionary Workers Party is entirely possible. If we tap into the power of workers in the Federation, if we build a united front of workers and communities, the Workers Party indeed has a future. We hope that by building Workers Party units at universities, in workplaces and branches in communities and industrial areas, as well as through setting up district units and provincial structures, by October 2018, we will able to launch the Workers Party. It may not necessarily take the form of a national congress because we want to ensure that there is democratic participation from all our 9 provinces but we certainly want to say that the party has arrived, that we are building it. There is the debate of what to do regarding contesting the elections in South Africa in 2019. I should say that the debate hasn’t really started but it is something on our agenda. We have begun the process of registering the party and the independent election commission has confirmed that they are working on the registration. Considering the situation in our country, we will be holding a working class summit from July 21-22 to take forward the struggle against labour law amendments, the national minimum wage and developing political and economic demands that we would put before the working class. We think the intensification of class conflict and class struggle is on the immediate agenda. One important issue is the question of land redistribution and the demand for expropriation of land without compensation. That would also be a key demand. Of course, there are many issues in the public domain with regard to education, health, water, sanitation and electricity, but more importantly, our struggle will be against unemployment, poverty, inequality and corruption, which are quite endemic in our country. So that, in a nutshell, is what we are busy with. On an international level, we are in contact with the trade union movements and socialist organizations across the world because we think building socialism can’t be done in one country. You’ve got to build up links so we have various programs with different trade unions. One of our focus areas is also on building trade union movements in the continent of Africa and so we are working closely with unions in Mozambique, Lesotho, Zambia, Namibia and Zimbabwe. We have just been invited to Morocco to talk to the workers party and trade union movements there.